His power: Angel has wings that allow him to fly. His story: Warren Worthington III initially soared into the XMU in X-Men: The Last Stand as the mutant son of an industrialist developing a “cure” for the mutant gene. Warren is introduced cutting off his new wings as a boy hitting puberty, and a decade later, he’s the first person chosen to receive the cure. Despite his father’s wishes, Warren refuses to go through with the procedure and breaks free, proudly spreading his wings and flying away to Xavier’s School For Gifted Youngsters, where he becomes a much-needed source of hope in the wake of Charles Xavier’s recent death. Warren saves his father’s life during Magneto’s attack on Worthington Labs, but he’s one of the main victims of The Last Stand’s overstuffed story and never gets the opportunity to become a more fully formed character. 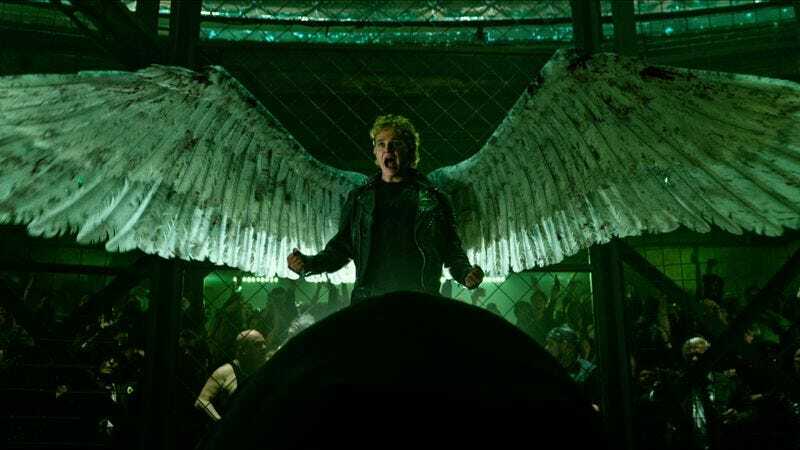 Angel is one of the off-screen casualties of the Sentinels in X-Men: Days Of Future Past, and he doesn’t fare much better in the new timeline created by that film. Angel returns in X-Men: Apocalypse as a cage fighter who later becomes one of Apocalypse’s four horsemen, and the film doesn’t explain the new status quo for Warren or give him any substantial character traits. He has metal knife-wings and that rockin’ Angel bod, but there’s no reason to care about Angel when he’s killed off at the end of the movie, especially because he’s a flying character who foolishly dies in a plane crash. Currently, Angel is: In heaven. Where will we see him next? It’s entirely possible that Angel’s death isn’t permanent given the tendency for X-Men characters to get resurrected in the comics, but there are no current plans to mishandle the character for a third time in film.